Hi there friends! how are you? I've been coughing up a storm, not sure if I've caught whatever Bret has or I'm just having problems with the smoke in the air, but cough cough cough is all I do. It's a toss up considering all the smoke in the air from the fires buring away in California. In the meantime I've tackled another Moda Blockheads 2 block. I may or may not have been influence by my ironing board! 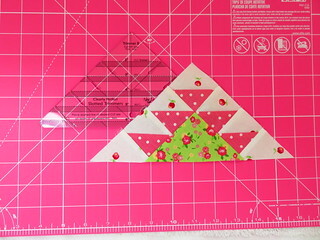 Lots of triangles in this block by Lynne from Kansas Troubles. My triangle piecing isn't that great, but I made my little half square triangle blocks and got out my Clearly Perfect Slotted Trimmers from Kari and trimmed them up. Holy cow my segments went together perfectly with no nudging or pulling and I felt like I was winning at life. I've tried all kinds of methods and tools but this one is my favorite. I'm just not the piecer I used to be and honestly I was never that great. I've had to use a lot of gentle persuasion over the years to make things line up. This time, all good. Of course I did get a little prideful and the last corner unit I attached had to be talked into working out which goes to show me I ought not get too full of myself. Pride and all that! My blocks are looking like a jumbled mess, not sure how I like the combos I have going. Everyone's blocks all look so good together, mine look like they have an identity crisis going on. Oh well. Whatever, it's all in fun right? I have spent some time thinking about how to handle the three blocks I haven't done yet and how I can use them to make these make sense. Or maybe I'll slam them all together and just say hey, what the heck. Or maybe I'll get distracted by something else and WHO KNOWS WHAT CAN HAPPEN. 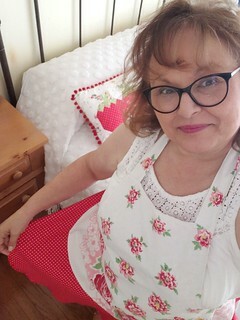 Speaking of housework, do you wear an apron? I have a million white tops so I always wear an apron. I always think about an old original series episode of Queer Eye when the guys lament that the contestant's wife got dirty from her own house. OMG THAT'S ME. I'm constantly leaning into something so I always put on an apron when it comes time to clean. Look at how cute my favorite apron is! Elizabeth made this for me for Christmas one year, and I love it. 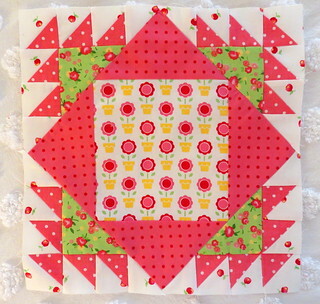 Love the fussy cut vintage tablecloth. Elizabeth is such a talented seamstress. It's super cute on. And it looks perfect hanging up in my kitchen. Which is where it went about 5 minutes after this photo because duh, you can't do dirty stuff in this apron. I'M NOT PERFECT PEOPLE. I am trying to use stuff and not save it but some stuff needs to be saved. 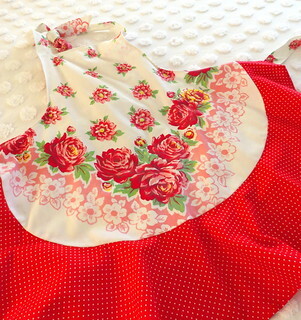 Like this apron. Ok, that's all the nonsense from these parts, FOR NOW. What's up with you? It's the last week of the Spelling Bee! I can hardly believe it! So many blocks! 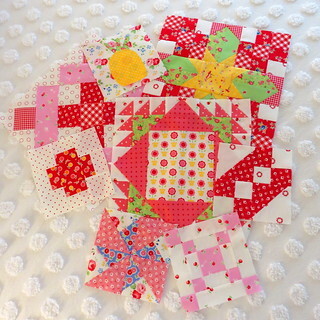 Thanks to Fat Quarter Shop and Lori for inviting me to play along! Don't worry, Lori isn't out of cute ideas! That fall quilt and the new Vintage Christmas book will be here before you know it! Thanks for the cute recap of the year Fat Quarter Shop! Hi friends! How are you? I can't believe it's August already, and as I'm sure I've mentioned before, time is flying by at a record pace. My sewing room is still a mess and stuff is all over the place, but I did manage to get a couple of Moda Blockhead Blocks done. They're the easy ones of course. 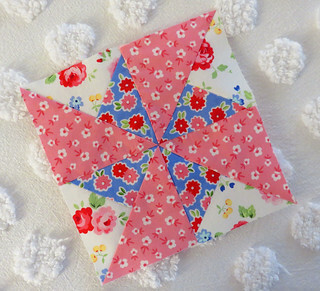 This cute block is by Stacy Iest Hsu and you can find the instructions here. 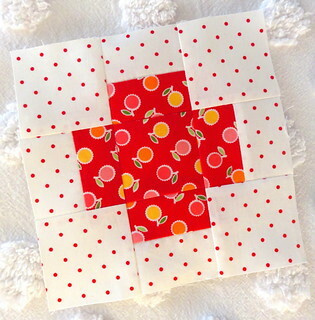 This little chubby plus block is by quilting idol Laurie Simpson and you can find it here. Mine looks a little funky due to the fact that I had to lean way over some crap to cut it out. Not all that accurate considering it's all squares and rectangles. Oh well. It was fun to dig thru my larger scrap box for some older PKM fabrics like that red. 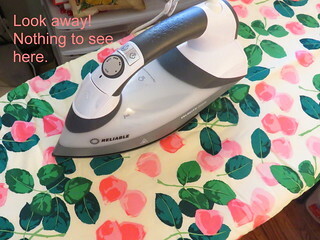 In my renewed effort to use things I've been saving, get a load of this pretty ironing board cover! It was a gift a least at year ago if not more... and I've been saving it. Duh. But with the duct work came a fine layer of dust all over my sewing room, making it the perfect time to change that old yucky cover for this pretty one. Lets see how long it lasts. In the mean time ignore that crap that's normally behind the curtain. We still have some testing to be done on the new furnace/ac/ductwork and they need access to the vent that's behind a bunch of stuff normally hidden by a curtain.